Welcome to The Lumber Lounge! Here's where you'll be able to take a behind-the-scenes look at the Clinton LumberKings with Radio Broadcaster Chad Seely. The LumberKings are the Class-A affiliate of the Seattle Mariners. Michael Pineda will more than likely be a staple in the New York Yankees rotation for the next 10+ years in The Bronx. When a young talent like the 6-foot-5 inch right-hander is traded at 23 years old, the questions certainly follow. The answer was simple for the Mariners. They made the move because the pitching depth in the organization is as good as it ever has been. To have that, and acquire a bat like Jesus Montero, the trigger was pulled. Mariners Executive VP and GM Jack Zduriencik spent many years as the Director of Scouting and Special Assistant to GM Doug Melvin in Milwaukee before landing in Seattle. Melvin would be the first to tell you Zduriencik played a huge role in the drafting and development of players such as Ryan Bruan, Prince Fielder, Rickie Weeks, Corey Hart, Yovani Gallardo and J.J. Hardy. Before those days, the Brewers were a miserable franchise in a city starved of a winning ballclub. In other words, it took time. And the same process is happening in Seattle with the reinforcements on the way. MLB.Com’s Draft & Prospect Expert Jonathan Mayo has produced his annual “Top 100 Prospects” list and the Mariners hold the #1 spot in the “prospects points” category. With Montero leading the way, Seattle has five top 100 prospects. Montero checks in at #12, LHP Danny Hultzen at #16, RHP Taijuan Walker at #18, INF Nick Franklin at #52 and LHP James Paxton registers at #77. More than likely, Montero will be the only one who starts the year in Seattle, but Hultzen and Paxton could join him by the end of 2012. In less than 500 at-bats between AAA-Scranton/Wilkes-Barre and New York, Montero had 23 doubles and 22 home runs to go along with 79 RBIs. While his glove still needs work behind the dish, his bat is more than ready for big-league pitching. Hultzen and Paxton are both power lefties who figure to be right alongside Felix Hernandez in the Seattle rotation for years to come. Hultzen, 22, selected with the #2 pick in the 2011 draft is expected to rise quickly. While he doesn’t have Matt Moore type stuff, the University of Virgina product has his own nasty arsenal. His fastball clocks in the mid 90’s while he features a plus changeup and a developing slider. I’d expect Hultzen to start at AA-Jackson and possibly AAA-Tacoma. Paxton dominated in 2011, his first season in professional baseball. Splitting time between Lo-A Clinton and AA-Jackson, Paxton was 6-3 with 2.37 ERA in 17 starts. In 95 innings, the lefty struck out 131 and held opponents to a .215 batting average. Like Hultzen, expect Paxton to start at either AA or AAA. 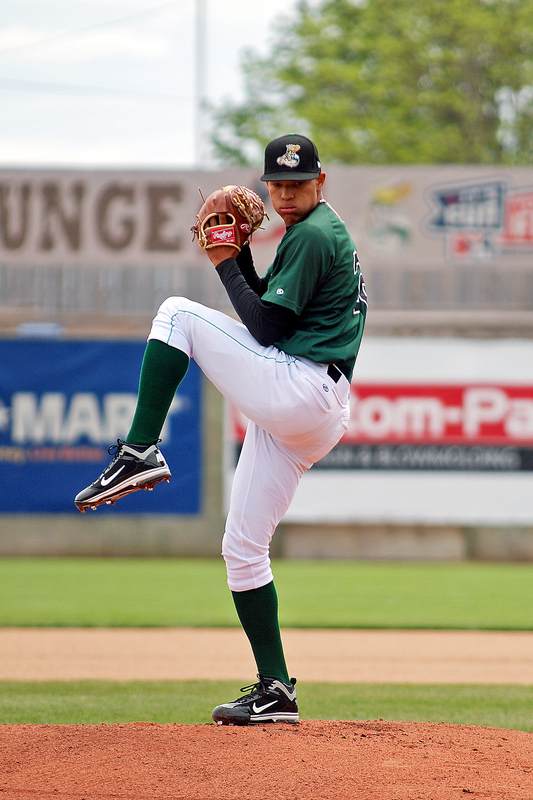 The other dominant arm in the Seattle organization is right-hander Taijuan Walker. At just 19, Walker’s stuff is electric with a mid 90’s fastball and a sharp, hammer curve. The righty started 18 games last year for Clinton, racking up a 6-5 record with a 2.89 ERA. In 96 2/3 innings, Walker struck out 113 and held opponents to a miniscule .202 clip. Expect Walker at AA-Jackson in 2012. The Mariners will be sure to not rush the development of Walker but Hultzen and Paxton are very close to making their big-league debuts. All three pitching prospects have been invited to spring training. With only two winning seasons since 2003, the steps are being taken to bring winning baseball back to Seattle, even without the uber-talented Michael Pineda.